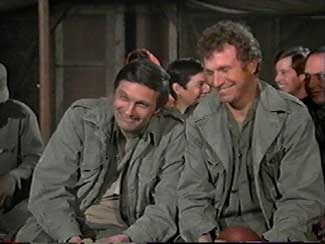 Here's some fun convos between those well-known surgeons from the 4077th. Frank: That'll be the day. Frank: That doesn't scare me a bit! Frank: That was totally uncalled for. Hawkeye: One of these sandwiches just moved. Hawkeye: "Henry, you're not going to endorse this idiot's application, are ya?" Margaret: "That's 'Major' to you, Captain!" Hawkeye: "Henry, you're not going to endorse this major idiot's application, are ya?" Henry: "Pierce, that's a decision I'll decide when I decide and make my..uh..decision and that will..uh...decide it." Frank: Keep it down, I am doing something very difficult here. Hawkeye: Trying to tie your shoe again, Frank? Hawkeye: I'd give 10 dollars for this war to be over. Trapper: Put me down for ten. Hawkeye: 20 bucks! How could they turn us down? Trapper: We could go up to 25, but don't tell them that in the beginning. Trapper: Klinger is not a pervert! Margaret: How do you know? Trapper: Because I am one, and he's never at the meetings. Nancy: "And I looked through this dirty book I found hidden on your shelf behind Aerosmith." Hawkeye: "Dirty book? It's Snow White and the Seven Dwarves." Nancy: "Oh. Then how come one of the dwarves is named 'Leather'?" Hawkeye: "Hot Lips, if you don't get out of here I'll shoot you." Radar: "It's not Hot Lips, it's Radar"
Hawkeye: "Radar, if you don't get out of here I'll shoot Hot Lips." Hawkeye: "Listen, what I don't understand is what a guy like you, with your...with your background is doing here in the infantry. Why aren't you a correspondent or something?" Tommy: "I'm keeping my country safe from the Communist menace!" Hawkeye: "You used to be a Communist!" Tommy: "I'm keeping my country safe from me!" Col.Flagg: CIA doesn't supersede anyone's orders. Hawkeye: Boy, your mind's in the gutter. Trapper: I can't help it. It's attached to my body. Frank: And, of course, the coffee is cold again. Trapper: It's getting better. It's less purple. Frank: Major Houlihan's father was under general McArthur in the cavalry. Hawkeye to Trapper: Her father was a horse, did you know that? Frank: You are common drunks! Hawkeye: This is a rumor started by people I've fallen over. Frank: There's no place in this room for perverts! Hawkeye: Should we all leave alphabetically? Frank: Need some help, Pierce? Hawkeye: No, I'd rather save the patient. General McArthur's aide: When answering, always use general's full name: "Yes, general McArthur", "No, general McArthur", "Thank you, general McArthur". Potter: Hawkeye, fire that weapon! Hawkeye (taking the gun and talking to it): You are fired. ... I did it as gently as I could. Col.Flagg: Who is your second in command? Hawkeye: Maniac Depressive, it's an honorary title. Henry: You do trust Father Mulcahy? Hawkeye: It says I should on all my money. Frank: Oh, what about the pig sty we live in? My part in neat and tidy, but the other two parties, who shall be nameless, live like swines. Both (shaking hands): The Swine Brothers. Hawkeye: We brought you some champagne. Trapper: 15 minutes ago was a very good year! Frank: I didn't come here to be liked. Radar: You certainly came to the right place. Hawkeye: Showing off for the patients again, Frank? Henry: What am I supposed to do? He is a two-star general! Hawkeye: But he is a three-star loonie!! General Steele: You are insubordinate! Gen. Steele: You are insolent! Hawkeye: Right! And you are nuts! Potter: I made Mulcahy the new garbage officer. Hawkeye: Some men are born to garbage, others have garbage thrust upon them. Frank: We are still at war, you know. Hawkeye: Oh, I guess, that explains all the boom-booms. Henry: She'll be in her own tent, I'll be in mine. Hawkeye: Right, now if you excuse us, we'll begin digging out the tunnel. Henry: These are captains Pierce. Hawkeye: And these are captains McIntyre. Nancy: You just have to be Corporal O'Reilly!!! Radar: Yes, I guess I have to be. Hawkeye: Cause nobody else wants to be. Trapper: Klinger, how can you wear just a skirt in a cold like this? Klinger: You think it's easy being a nut? Frank: There's one of those in the camp. Hawkeye: Which one of those thoses do you mean, Frank? Henry: ....living in tents like animals. Hawkeye: I didn't know animals live in tents. Margaret: I don't know which one of you is more obscene. Trapper (pointing to Hawkeye): He is. We took a poll. General Barker: Doesn't anybody in this outfit ever goes to bed?? Radar: Only on duty, sir. Frank: Sir, I wonder if I can say something useful. Trapper: I've often wondered that myself. Hawkeye: I've got my own gripes, sour gripes! I am bored bored bored bored bored. Frank: This man is Chinese! Hawkeye: Then we'll operate with chopsticks. Frank: "Normal" is everybody doing the same thing. Hawkeye: What about individuality, Frank? Frank: Individuality's fine - as long as we all do it together. BJ: Tell Cpt. Pierce what you just told me. Sgt. Blanchard: Are you sure he is okay? BJ: He is not okay, but you can trust him. BJ: why don't we toast the happy couple. Hawkeye: They are too big for our toaster. Igor: No, sir, -- flies! Frank: I am confining you to quarters, Klinger! Hawkeye: I am confining you to quarters, too. Give me all your nickels and dimes. Potter: Would somebody please change the subject. Hawkeye: Why? Did it wet itself? Charles: What is that odor? Radar: North wind cesspool, east wind latrine. Charles: The wind is from the South. Radar: Oh, that's the kitchen. Hawkeye:"Of course, but rent one first to see if you really like it"
Frank: I love it here. Potter: Either you or Klinger is nuts; now I've got to figure out which one. Hawkeye: Good, have my brains removed. Radar (speaking of his temporary tattoo): It will come off when I take a bath. Hawkeye: My God, it is permanent.